If you’re reading this article, the chances are that you either experience a level of stress or anxiety while flying – or worse still, have had to leave someone at home who just couldn’t face a flight. In either case, you need to know that help is at hand and there is absolutely no reason why you shouldn’t look forward to the joys of travelling for pleasure – or the rewards of travelling for business. 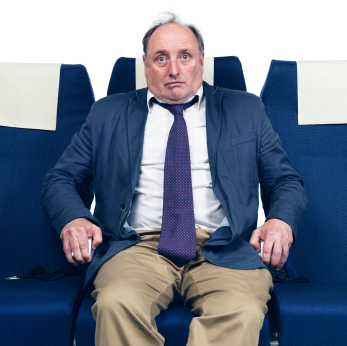 You might be surprised to hear just how widespread fear of flying really is. Over 1.5 million Irish people leave the country in search of a little sunshine every summer, for example. And of that total, the U.S. National Institute of Mental Health estimate that up to 10% will have a significant problem with flying. That amounts to a whopping 150,000 Irish people who have the fear of flying. There’s a very good chance, in fact, that some of your fellow travellers are experiencing varying degrees of discomfort and even panic right now. Irish people, the fear associated with flying is so strong that it makes them miserable for weeks before the holiday. And clients have told me that even as they laze on that far-flung beach, they can feel a knot in their stomach at the prospect of the return flight. So why not stay at home and save themselves the hassle? That’s certainly a possible solution, but it means you’ll never see your kids’ faces light up in Disneyland, for example. Barrier Reef, you’ll never see the Pyramids, you’ll never see the Mona Lisa in the flesh. In short, you’ll never experience the amazing cultural, social and leisure riches that the world has to offer us. Or maybe you’ll have to leave a partner at home who is paralyzed at the prospect of flying? You may also find that your career is limited if you’re unable to take part in regular international travel. If you’re promoted, for example, and have to fly regularly to a European Head Office, think how problematic that could be. And the great tragedy, of course, is not so much that it happens, but that it doesn’t need to happen. Even right now, there are a number of easily accessed techniques that you can use to address your fear. They allow you to change your thoughts, and in doing so, you can change your response by releasing the fear, allowing you to relax and enjoy your flight. Try either of these simple breathing techniques as a starting point. Firstly, breathe in to the count of four, hold your breath for the count of four, breath out for the count of four and hold your breath for the count of four. This allows the brain to switch modes, so if you are focusing on something that is causing you any stress, the exercise will totally transform it. An alternative exercise is to touch the point on your cheekbone under the centre of your eye with your fingertips and take two deep breaths. Then, place the fingertips underneath your collarbone and take two deep breaths. Finally, place your fingertips under your arm about four inches below the armpit and take two deep breaths. These are simple exercises that will get you by until you can see a therapist about addressing the more deep-rooted problem. And for people with phobias such as fear of flying, the payback is enormous as they receive the freedom to go where they want, when they want, as often as they want, with no limiting factors in the form of fear. I’m reminded of a recent client of mine – a successful businesswoman – who took time off to embark on a major tour of Asia. Following a series of sessions, she wrote to me after her trip to say that she’d been on twelve flights, four of them long-haul, without any problems whatsoever. In many cases, there can be a major shift in attitude even before the subjects set foot in the airport, while in other cases their maybe a slight anxiety until they realise that they are, indeed, cured of their phobia when they put it to the test by boarding an aircraft. So if you’re feeling any way uneasy on this flight – or if you know someone who’s being held back by fear of flying, take heart from the knowledge that you can do something about it. And once you’ve resolved your fear, there’s a whole wide world out there just waiting for you.